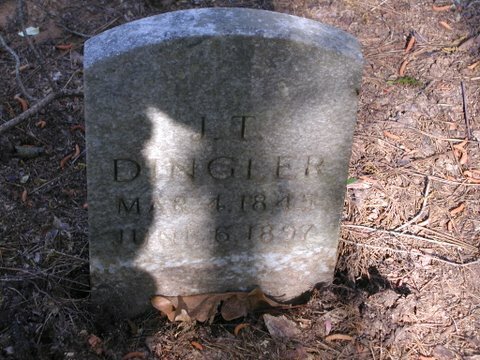 Coordinates for the Dingler cemetery are N 33 35 36.3 and W 084 53 50.1 – it’s in landlot 184, district 3, section 5. 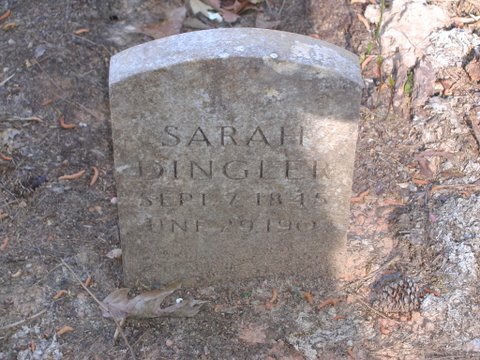 When James Dingler settled here in the 1850s, it was part of Carroll County but subsequently became part of Douglas County in the 1870s. James moved here from Pike County, GA. The Sticher cemetery and the Dingler cemetery are one and the same (though we found no Sticher markers). John’s sister Clarissa married Newton Sticher, and they’re both buried just up the road in Oak Grove cemetery — along with several other members of the Sticher family. The photos I received were resized from the originals, so I’m checking to see if we can get the originals. I’ve posted them as is but will re-post if I can get the originals. Here are J.T. and Sarah’s markers. To see all of the photos and for more info about the cemeteries, see the links that follow.